Mountain Rescue Teams, like the Wilderness/Land Search teams, provide support to local emergency management or emergency services agencies by assisting in the location of missing persons, lost/overdue hikers, persons with cognitive impairments who have wandered from caretakers, or any individual that is reported as a lost or injured and whereabouts are unknown. These teams are made up of professionals that have received advanced training to conduct SAR activities in mountainous environments. Teams are prepared to handle technical rope access issues, snow, avalanches, ice, crevasses, glaciers, alpine environments and high altitudes. The difficult and remote nature of the terrain in which mountain rescue often occurs has resulted in the development of these teams. North Carolina Mountain Rescue teams also train with the North Carolina Helo-Aquatic Rescue Team (NCHART) to assist in safely providing support should the rescue require the use of a helicopter. 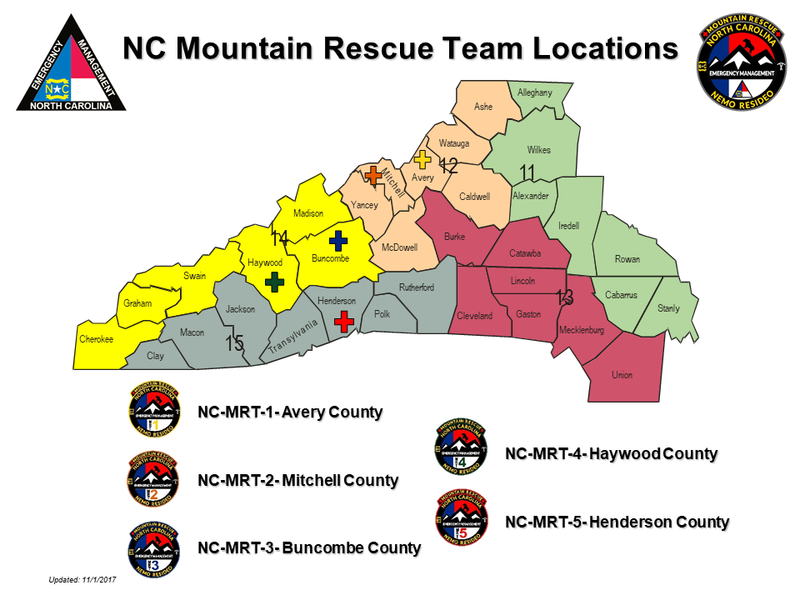 North Carolina maintains five mountain rescue teams in the state. At a minimum, teams maintain set skills, training, equipment, and capable personnel to respond to a wide array of rescues. Based on the location and type of incident, the State Emergency Operations Center identifies the nearest and most appropriate resource to deploy. To receive technical assistance or request mountain rescue resources call the NCEM Emergency Operations Center at 919-733-3300.